Signal transduction pathways converging on the tumor suppressor p53 are central in the regulation of cell growth and cell death. Conventional chemotherapeutics result in p53 checkpoint activation. However, when the p53 pathway is blocked, or mutated, a more targeted chemotherapeutic approach is required to result in cancer cell death. A focus on such targeted approaches are central to the research being carried out in the Bargonetti laboratory. The work focuses on the mutant p53, Mdm2, and MdmX molecular signal transduction pathways and we work to activate p53-independent cell death pathways that facilitate killing resistant cancer types. Presently this work is carried out using human cancer cell line models, xenograft models, and C. elegans nematode models. The Bargonetti research team is using genetically engineered tools to decrease expression of and/or mutate the three oncogenes (i.e. Mdm2, MdmX, and oncogenic mutant p53) because we hypothesize that these biomarkers are involved in the formation of different subtypes of breast cancer. Projects 1: Oncogenic Gain-of-function (GOF) Mutant p53. The Bargonetti team recently defined a novel gain-of-function mutant p53 pathway that they termed the mtp53-PARP-MCM axis. This mtp53-PARP-MCM axis can be targeted using a PARP inhibitor that traps PARP on chromatin. We discovered of a set of interactions between mutant p53 (mtp53), PARP, and MCMs on chromatin that may elucidate at least one aspect of gain-of-function (GOF) mtp53. In addition, we observed that high mtp53 and PARP sensitize cells to PARP inhibitors (PARPi) plus DNA damage, suggesting a therapeutic targeting approach. In addition, we observed that high mtp53 and PARP sensitize cells to PARP inhibitors (PARPi) plus DNA damage, suggesting a therapeutic targeting approach. We are currently working on projects that address the mechanistic role of GOF mtp53 at replication forks and how mtp53 helps to recruit replication factors. Projects 2: MDM2 and MDMX p53-independent oncogenic roles in breast cancer..
We discovered that reducing the amount of Mdm2 in breast cancer cells reduces tumor growth and abnormal architecture in three-dimensional (3D) cell culture models. We identified that estrogen receptor positive (ER+) breast cancer cells possess an Mdm2-associated growth activation pathway. Our work has been instrumental for introducing the concept of an estrogen driven signaling pathway that uses a non-canonical Mdm2 molecular mechanism. We are dissecting the relevant targets of Mdm2 and MdmX in different subtypes of breast cancer. We recently discovered that both Mdm2 and MdmX promote triple negative breast cancer metastasis (TNBC). We are currently addressing if blocking the Mdm2 and MdmX proteins with pharmacological agents can inhibit TNBC metastasis. The Bargonetti group also investigates alternative forms of MDM2, inclusing MDM2-FL and MDM2-C, that are expressed when a single nucleotide polymorphism (SNP) at position 309 in the mdm2 gene that causes increased Mdm2 overexpression. This overexpression can inhibit wild-type p53 activity but also causes p53-independent oncogenic functions in cells expressing mutant p53. Projects 3: The roles of Mutant C. elegans p53 1 (CEP1) in hyperproliferative germline and worm lifespan. Undergraduate students are invited to register for Introduction to Experimental Biology to get college credits for working on this C. elegans project. This is a genetics and cell biology experimental cell biology project. Jill Bargonetti received her B.A. from SUNY Purchase, her M.S. and Ph.D. from New York University and her postgraduate training from Columbia University. While in the Purchase Dance Corps she performed works by Sarah Stackhouse and Paul Taylor and then went on to became a member of Dianne McIntyre’s Sounds in Motion from 1983-1985. 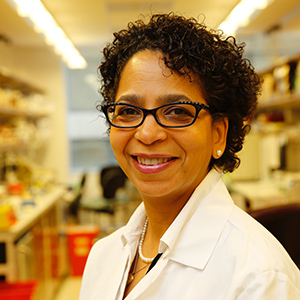 In 1994 she became as an Assistant Professor at The City University of New York (CUNY) at Hunter College and The Graduate Center in the PhD Programs of Biology and Biochemistry and currently holds the title of Full Professor with tenure. Bargonetti was awarded the prestigious Presidential Early Career Award for Scientists and Engineers by President Bill Clinton in 1997, and has received research grants from the American Cancer Society, The Department of Defense, The National Science Foundation (NSF), The National Institutes of Health (NIH), and the Breast Cancer Research Foundation (BCRF). She was a member of the National Cancer Policy Board from 2002 until 2005 (a board of the Institution of Medicine and National Research Council of the National Academies) and served on the NIH Tumor Cell Biology study section from 2012-2018. She is currently a reviewer for American Association of Cancer Research grants and reviews manuscripts for numerous high impact journals. Choreographing Genomics: Her understandings on the unifying principles of dance, genomics, and cancer inspire her work. Polotskaia, A., Xiao, G., Reynoso, K., Hendrickson, R., Martin, C., Qui, W. and J. Bargonetti. Proteome-wide Analysis of Mutant p53 Targets in Breast Cancer Identifies New Levels of Gain-of-Function that Influence PARP, PCNA and MCM4. (2015) Proc Natl Acad Sci U S A.;112(11):E1220-9. Hoffman S., Martin, D., Melendez A. and J. Bargonetti C. elegans p53 and Beclin 1 are involved in DNA repair. (2014) PloS One Feb 20;9(2):e88828. Okoro D., Arva N., Gao, C., Polotskaia A., Puente, C., Rosso, M., and J. Bargonetti. Endogenous Human MDM2-C is Highly Expressed in Human Cancers and Functions as a p53-independent Growth Activator. (2013) PloS One Oct 11;8(10):e77643. Polotskaia, A., Krett, N., Shanmugam, M., Gamss, S., Rosen, S., and Bargonetti J. 8-Aminoadenosine activates p53-independent cell death of metastatic breast cancers. (2012) Molecular Cancer Therapeutics. Okoro D., Rosso M., and J. Bargonetti. Splicing up Mdm2 for Cancer Proteome Diversity. Genes & Cancer August 2012. Freed-Pastor, W. A., Mizuno, H., Zhao, X., Langerod, A., Moon, S.-H., Rodriguez-Barrueco, R., Barsotti, A., Chicas, A., Li, W., Polotskaia, A., Bissell, M. J., Osborne, T. F., Tian, B., Lowe, S. W., Silva, J. M., Borrensen-Dale, A.-L., J., L. A., Bargonetti, J., and Prives, C. (2012) Mutant p53 Disrupts Mammary Acinar Morphogenesis via the Mevalonate Pathway, Cell 148(1-2):244-58. Success in Molecular Genetics: The Pink Flower" in Voices of Black American Pioneers, edited by Vernon Farmer, Greenwood Publishing Group, Westport, Connecticut (2012). Paz, M.M., Ladwa, S., Champell, E., Liu, Y., Rockwell, S. Boamah, E.K., Bargonetti, J., Callahan, J., Roach, J., and Tomasz, M. Mapping DNA Adducts of Mitomycin and Decarbamoyl Mitomycin C in cell Lines Using Liquid Chromatogrphy/ Electrospray Tandem Mass Spectrometry. (2008) Chem. Res. Toxicol., 21(12): 2370-2378. Arva, N., Talbott, K., Okoro, D., Brekman, A., Qiu, W., and Bargonetti, J. Disruption of the p53-Mdm2 Complex by Nutlin-3 Reveals Different Cancer Cell Phenotypes. (2008) Ethnicity and Disease, 18(2 Suppl 2):S2-1-8. Boamah EK, White DE, Talbott KE, Arva NC, Berman D, Tomasz M, Bargonetti J. Mitomycin-DNA adducts induce p53-dependent and p53-independent cell death pathways. ACS Chem Biol. 2007 Jun 15;2(6):399-407. Epub 2007 May 25. White DE, Talbott KE, Arva NC, Bargonetti J. Mouse double minute 2 associates with chromatin in the presence of p53 and is released to facilitate activation of transcription. Cancer Res. 2006 Apr 1;66(7):3463-70. Bond, G.L., W. Hu, E.E. Bond, H. Robins, F. Bartel, H. Taubert, P. Wuerl, K. Onel, L. Yip, S. Hwang, L.C. Strong, N.C. Arva, J. Bargonetti, G. Lozano, and A.J. Levine (2004) A Single Nucleotide Polymorphism in the Mdm2 Promoter Attenuates the p53 Tumor Suppressor Pathway and Accelerates Tumor Formation in Humans. Cell 119:591-602. Hui, L., Abbas, T., Bargonetti, J., and D.A. Foster. (2004). Phospholipase D Elevates the Level of MDM2 and Suppresses DNA Damage-Induced Increases in p53. Mol. Cell Biology (24): 5677-5686. Abbas, T., M. Olivier, J. Lopez,, S. Houser, G. Xiao, G. S. Kumar, M. Tomasz, and J. Bargonetti (2002). Differential activation of p53 by the various adducts of Mitomycin C. Journal of Biological Chemistry 277(43):40513-9. Bargonetti, J. and J.J. Manfredi. (2002). Multiple roles of the tumor suppressor p53. Curr. Opin. Oncology. 14:86-91. Houser, S., S.Koshlatyi , T. Lu , T. Gopen, and J. Bargonetti (2001). Camptothecin and Zeocin Can Differentially Increase p53 Levels During all Cell Cycle Stages. Biochem Biophys Res Commun. 289:998-1009. Chicas, A., P. Molina, and J. Bargonetti (2000). Mutant p53 forms a complex with Sp1 on HIV-LTR DNA. Biochem Biophys Res Commun. 279:383-390. Xiao, G., A. Chicas, M. Olivier, Y. Taya, S. Tyagi, F.R. Kramer and J. Bargonetti, (2000). p53 requires a damage signal to activate gadd45. Cancer Research 60: 1711-1719. Boydston-White, S., T. Gopen, S. Houser, J. Bargonetti and M. Diem, (1999). Infrared spectroscopy of human tissue: V. Infrared Spectroscopic studies of myeloid leukemia (ML-1) cells at different phases of the cell cycle. Biospectroscopy 5: 219-227. Xiao, G., D. White, and J. Bargonetti (1998). p53 binds to a constitutively nucleosome free region of the mdm2 gene. Oncogene 16:1171-1181. Bargonetti, J., A. Chicas, D. White, and C. Prives (1997). p53 represses Sp1 DNA Binding and HIV-LTR directed transcription. Cellular & Molecular Biology 43:935-949. Chen, X., J. Bargonetti, and C. Prives, (1995). p53, through p 21 (WAF1/CIP1), induces cyclin D1 synthesis. Cancer Research 55:4257-4263. Prives, C., J. Bargonetti, G. Farmer, E. Ferrari, P. Friedlander, U. Hubsher, L. Jayaraman, N. Pavletich, and Y. Wang, (1994). The DNA binding properties of the p53 tumor suppressor protein. CSHS on Quan. Bio. LIX:207-213. Bargonetti, J., J.J. Manfredi, X. Chen, D.R. Marshak, and C. Prives, (1993). A proteolytic fragment from the central region of p53 has marked sequence-specific binding activity when generated from wild-type but not from oncogenic mutant p53 protein. Genes and Dev. 7:2565-2574. Bargonetti, J., P.Z. Wang, and R.P. Novick, (1993). Measurement of gene expression by translational coupling: effect of copy mutations on pT181 initiator synthesis. EMBO 12:3659-3667. Friedman, P.N., X. Chen, J. Bargonetti, and C. Prives, (1993). The p53 protein is an unusually shaped tetramer that binds directly to DNA. Proc. Natl. Acad. Sci. USA. 90:3319-3323. Bargonetti, J., I. Reynisdottir, P.N. Friedman, and C. Prives, (1992). Site-specific binding of wild-type p53 to cellular DNA is inhibited by SV40 T antigen and mutant p53. Genes and Dev. 6:1886-1898. Farmer, G., J. Bargonetti, H. Zhu, P. Friedman, R. Prywes, and C. Prives, (1992). Wild-type p53 activates transcription in vitro. Nature 358:83-86. Zambetti, G.P., J. Bargonetti, K. Walker, C. Prives, and A.J. Levine, (1992). Wild-type p53 mediates positive regulation of gene expression through a specific DNA sequence element. Genes and Dev. 6:1143-1152. Prives, C., J. Bargonetti, P.N. Friedman, J.J. Manfredi, and E.H. Wang, (1991). Functional consequences of the interactions of the p53 tumor suppressor protein and SV40 large tumor antigen. CSHS on Quan. Bio. LVL:227-235. Bargonetti, J., P.N. Friedman, S.E. Kern, B. Vogelstein, and C. Prives, (1991). Wild-type but not mutant p53 immunopurified proteins bind to sequences adjacent to the SV40 origin of replication. Cell 65:1083-1091.